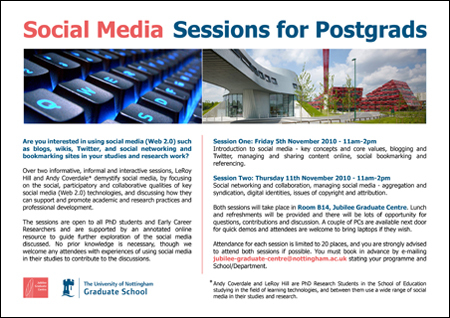 Next month I’ll be back at the Jubilee Graduate Centre (JGC) with LeRoy Hill to run a new round of social media sessions for the new academic term. The original series of three lunchtime sessions earlier in the year attracted a great group of enthusiastic, multi-disciplinary PhD students and early career researchers, and led on to a further single all-day session at the Engineering Graduate Centre, and a presentation and paper (forthcoming) at the Future Learningscapes e-learning conference with JGC manager Tracy Sisson. (We also have a couple of sessions lined up at the Arts Graduate Centre, but that’s for another post). This time round, we’re presenting two longer sessions at the JGC. We have limited preparation time, so we won’t be diverting too far from the original format; combining presentation, discussion, and the opportunity for quick demos – and we are updating our online resource which support the sessions to encourage further exploration of the social media we are discussing. Our key aims remain to raise awareness of the potential of using social media in academic and research work, and provide an opportunity for dissuasion and sharing of best practices. But I hope the new sessions will also indicate both my and LeRoy’s evolving thought processes and perspectives from our individual doctoral research projects and our own personal and reflective use of social media. This entry was posted on Monday, October 18th, 2010 at 11:46 pm and is filed under Posts. You can follow any responses to this entry through the RSS 2.0 feed. You can leave a response, or trackback from your own site.